Director James Gunn allowed Facebook users to ask him anything - and he gave plenty of answers. Nestled amongst bits about favorite scenes or most difficult moments is confirmation of something (potentially) major: Adam Warlock was not in Guardians of the Galaxy. When Guardians of the Galaxy came out, geeks everywhere were trying to find every little hidden Easter egg, especially in the Collector's trophy room where Howard the Duck, Cosmo the psychic dog, a Dark Elf, a Chitauri (Chitaur? ), and numerous other odds and ends can be spotted. But the one with the most attention was the cocoon. I was adamant from the beginning that this was not Warlock's cocoon. It didn't really look like Warlock's cocoon for one, and for another, if it were him, I reasoned there would have been have been some focus on the cocoon itself (like Hawkeye in the first Thor). There was fan speculation of course, but when Gunn himself confirmed Warlock's status, I had to concede even though it made no sense within the context of the larger Marvel Cinematic Universe. Guardians of the Galaxy and the Infinity Stones: Who&apos;s What Now? As time went on, it seemed, the director (and likely producers) were thinking the same thing. And now Gunn has made it all but official. He made comments to this effect a few months ago and further confirmed it in the Facebook Q&A: That was not Warlock's cocoon. In the comics, Adam Warlock is the yin to Thanos' yang (or yang to his yin - it's complicated). The Mad Titan, with all his fire and bravado, wants to destroy all life in the universe, whereas the stoic and almost emotionless Adam Warlock wants to preserve it. Unleashed by Stan Lee and Jack Kirby at the zenith of their partnership, Adam Warlock - originally known only as "Him" - was created by a group of mad scientists to be the pinnacle of human aspirations. After realizing his creators wanted Him to conquer the world, he put an end to their evil and moved on. This godlike man bounced from one set of manipulators to another, eventually landing on Counter-Earth (a near-duplicate of our planet orbiting on the opposite side of the sun) where he became space Jesus for the entire planet. It was there he took the name "Adam" and first used the Soul Gem - the first revealed Infinity Stone - and gained the attention of cosmic forces. Though created by men, Adam Warlock exists outside destiny, meaning even omniscient entities cannot predict his future or the effects his actions can have of the cosmos. The Soul Gem also brought Adam into conflict with Thanos. The two would spend the next few decades of comics manipulating events, bystanders and each other during their cosmic-scale battle. The apotheosis of this on-going battle was, naturally, The Infinity Gauntlet, when Thanos became the supreme being of reality. Warlock stole the power from Thanos and became God - if briefly. Warlock lost godhood and entrusted the Infinity Stones with others. He gave the most dangerous gem, the Reality Stone, to Thanos. Despite being archenemies, there is no one Adam trusts and respects more than Thanos, and vice versa. Theirs is a frienemiship for the ages. Warlock may have been the first to be seen in that iconic cocoon, he is far the only one to use it. It is a device of cosmic rebirth and transformation, with those who emerge from it taking on new or altered forms and becoming important players in significant events. His female counterpart, Kismet, has made her own cocoon more than once. She has yet to become a major part of the Marvel Universe, but she has taken markedly different forms each time she emerged. For a time, she even placed small cocoons on her potential mates. 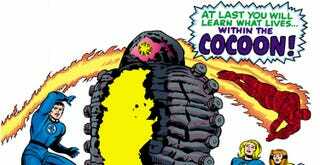 The mad scientists who created Adam Warlock spent some time in cocoons, emerging as superbeings. Thanos also used a cocoon recently, returning from one of his many deaths as a blank slate to become a weapon in Death's war with an alternate universe. Will Adam Warlock join the Marvel Cinematic Universe? Honestly, the story the MCU producers want to tell could work with or without Adam Warlock, but he is too significant of a character to throw in as a cameo. If they decide to use him, his appearance - perhaps in Guaridans 2 or Doctor Strange or even Avengers: The Infinity War: Part 1 - will be significant and monumental. If they don't use him, having him just appear in the background would seem like a jarring misstep.